A Buddy Bench, donated to St. John Catholic School, was moved from in front of the office to the outdoors in the playground at the border between the older and younger students play areas. Present for a brief ceremony were Paula Coffey, right, on behalf of the #GetInTouchForHutch group, along with Shirley Coffey, left, on behalf of the school council, where Cooper Fleet was presented with a T-shirt for his winning design for a T-shirt to be used in their campaigns. Also present was principal Rob Furfaro, for the ceremony held in front of all the classes. 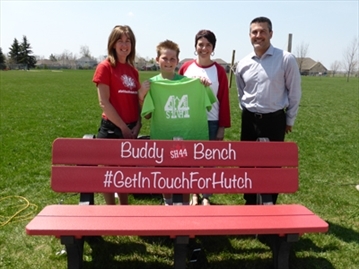 The idea behind the Buddy Bench is to promote friendship, inclusion, and the message that the students are never alone.